USDA data has shown that even if you eat a “perfect diet,” our food supply is simply not as nutritious as it was 30 years ago. Making dietary changes and supplementing your diet can help to correct these shortcomings. The only way to know if your diet is influencing your symptoms and the supplements you’re taking are working or knowing what vitamins/minerals and dosages you need are to get tested. Using blood work and other diagnostic tools will tell us where the problem areas are occurring or just developing. Our Laboratory evaluation is an innovative, scientific-based look at nutritional strengths and weaknesses through an individual’s blood test and analysis of hair, urine, and stool. This scientific approach can offer a clear plan for your optimum health. Does it make sense to compare your blood test results to averages taken from people who were already experiencing a health problem? No. That is why being simply being within the “Clinical Range” is not good enough! Being within the Clinical Range simply means you are not yet as sick as the other people used to determine that range. What if we look at a patient’s blood test more closely? Our testing also incorporates an “Optimal” or “Healthy” range in our reports. The Optimal Range simply takes the middle 20% of the Clinical Range. It’s designed with the concept of not waiting until a patients test result is “Clinical” to consider nutritional support or lifestyle changes. The point of the Optimal Range is to “flag” tests that are heading towards Clinical. Wouldn't you want to make minor changes now to avoid big problems later? As a Doctor, we cannot remember everything about every test available. Our laboratory testing does this for you in addition to providing over 30 years of clinical laboratory and nutritional experience. We can easily and efficiently validate every diet and supplement recommendations based on your blood work and other objective testing methods, not just a symptom survey. Our Laboratory testing will give you access to a state of the art patented, online, computerized analysis and reporting system. This system is central server based with no software or hardware compatibility issues. 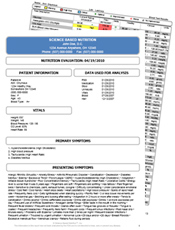 This gives doctors and patients a fast, detailed, accurate, and a personalized report. Because of our automation, there’s very little data entry and turnaround time is fast! Be sure to review this Case Studies!